welcoming us after a night crossing of the Mona Passage. Land ho! We actually do yell this (for fun) when the flat horizon of the sea gives way to the hazy silhouette of our destination. Sailing into a new port or tucking into a new remote cove is always exciting, and it's even more so when it's in new country. When traveling to a foreign land by air, the customs and immigration process is pretty easy, if monotonous. Just stand in line after arrival, and all your documents are processed before you leave the airport. 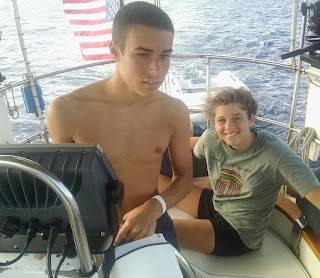 Arrival by boat, however, can be a bit more complicated. We, too, are required to check in and check out when entering or leaving a foreign country, but doing so can definitely be part of the adventure. 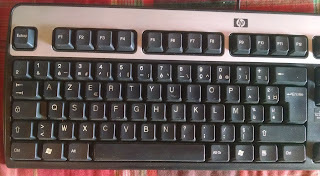 tricky when trying to type on a French keyboard. 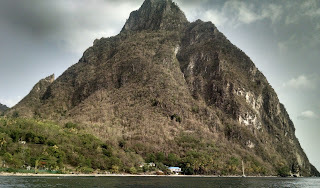 In some ports the customs house is an easy walk from the dinghy dock; at others it requires more of a hike. Some anchorages are not in the town where the island’s only customs office is located, so a bus ride is necessary. 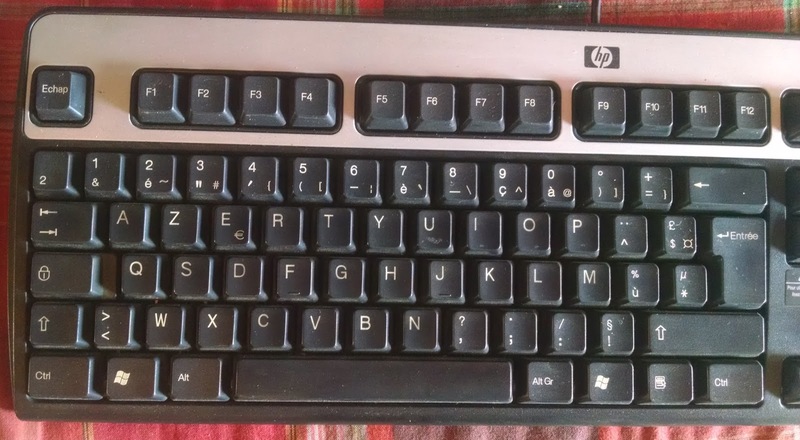 Clearing-in can be casual and low-key or serious business. The “customs office” in Deshaies, Guadeloupe was a small computer tucked into a corner of a souvenir shop. Most countries keep Customs open on weekends, but some charge overtime fees for check-in on those days. In Portsmouth, Dominica, arrival on a Saturday or Sunday means reporting around the corner to the Official’s shabby apartment – where you might spend some quality time chatting with his aunt. Authority, Immigration, and the Department of Agriculture. Some countries are stricter than others, enforcing the rule that only the captain may step foot on land, bearing ship’s papers and crew passports for processing. Some places – the French islands in particular – aren’t interested in even looking at a passport; just pay the customs fee and you can go on your way. significant source of revenue, and we left $508 poorer than when we arrived. Dominica, on the other hand, cost only $12 EC, which is just $4.45 US. 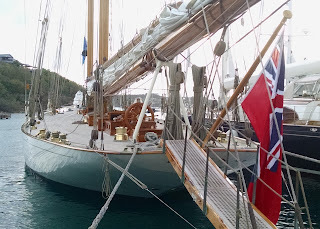 while she readies to sail out of Falmouth Harbour in Antigua. A traditional practice when sailing from country to country is the flying of a courtesy flag. 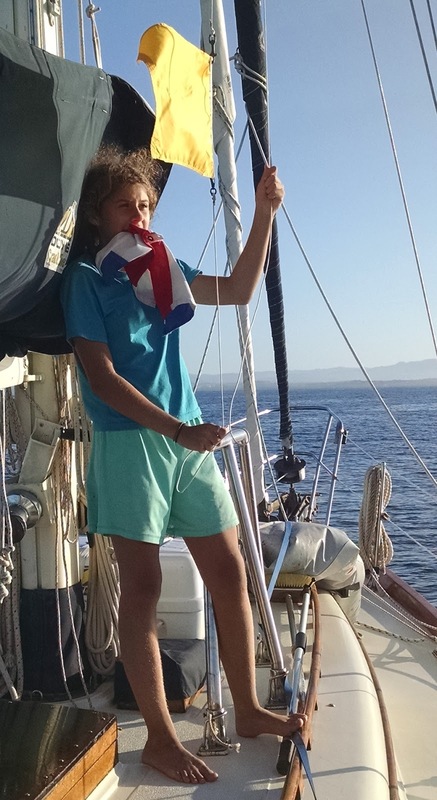 Maritime flag etiquette has a long-standing history, with very particular rules and traditions. 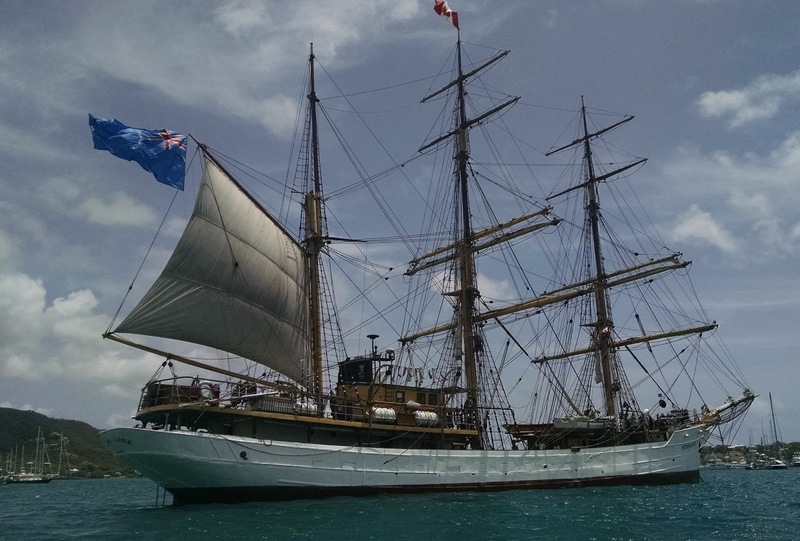 Elena of London and Atrevida both fly their ensigns from a stern flagstaff while at the dock in Antigua. Back before the days of the internet, or even radio for that matter, ships used flags to communicate. 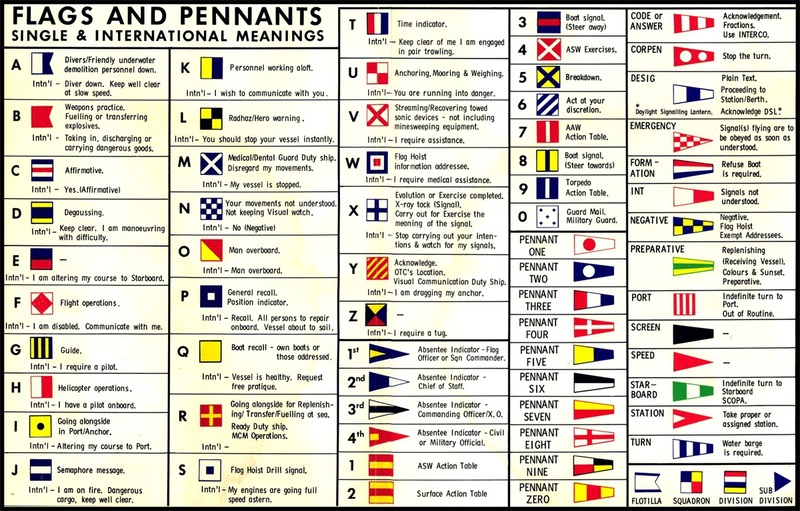 Specific signal flags indicate each letter of the alphabet, and different pennants, long-trapezoid-shaped flags, represent each numeral. 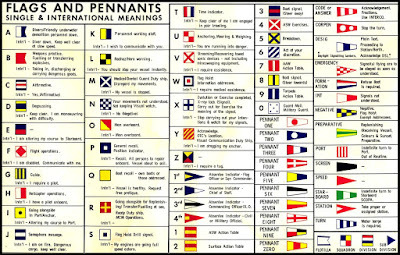 Each flag has its own meaning when flown individually (see the chart) and can convey other meanings when flown in combination. 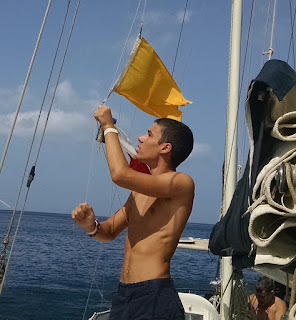 Communication flags are customarily flown from the foremost starboard spreader. Upon entry into an anchorage or port of a new country, a ship is required to raise the Q flag, which is a rectangle of solid yellow. 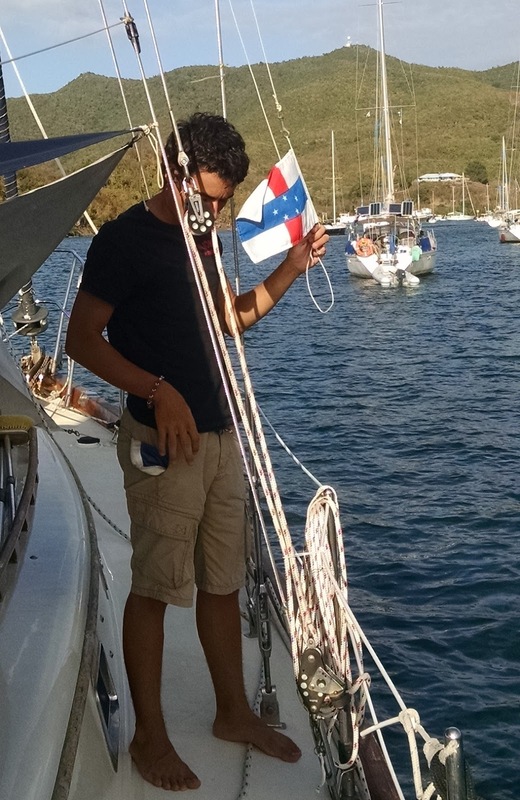 The Q flag, also known as the Quarantine flag, conveys the message, “Vessel is healthy. 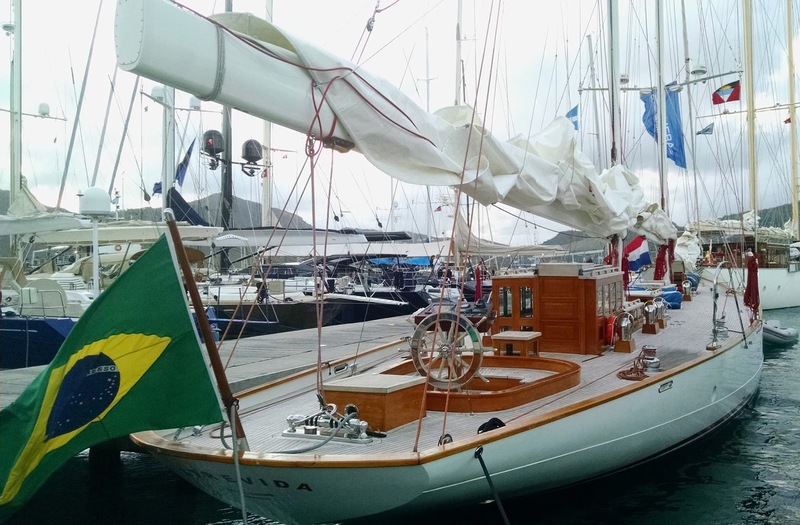 Request free pratique.” This translates to: all on board are free of contagious disease and the captain would like to obtain a customs clearance for all on board. Raising the Q flag as we approach a new country. 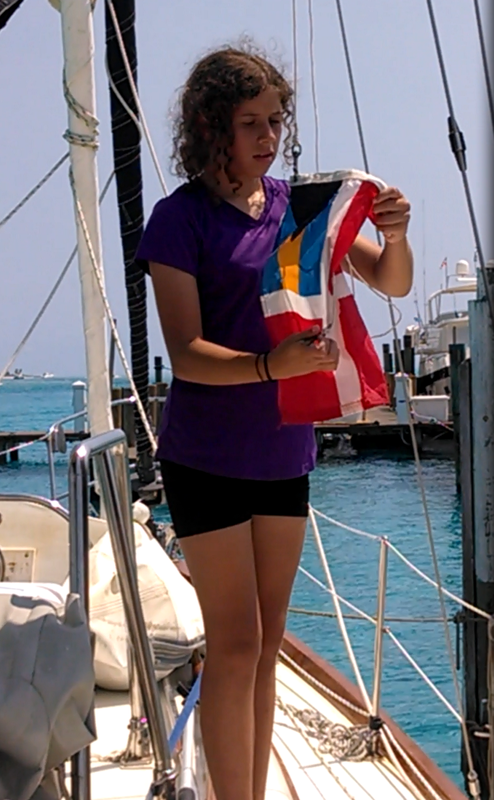 Once cleared through customs, a vessel lowers the Q flag and replaces it with a courtesy flag. 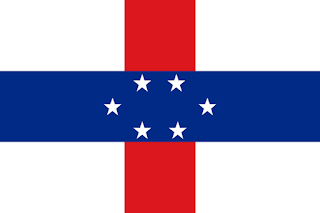 This flag is a small national flag flown by ships visiting foreign countries to show the intention to respect the laws and sovereignty of that country. There is no legal requirement to use a courtesy flag; it is simply a common practice and a courtesy to the country. 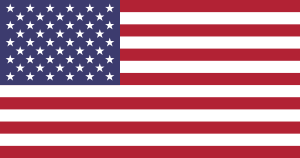 Some countries consider the use of a tattered or faded courtesy flag as disrespectful, and they will levy a fine. 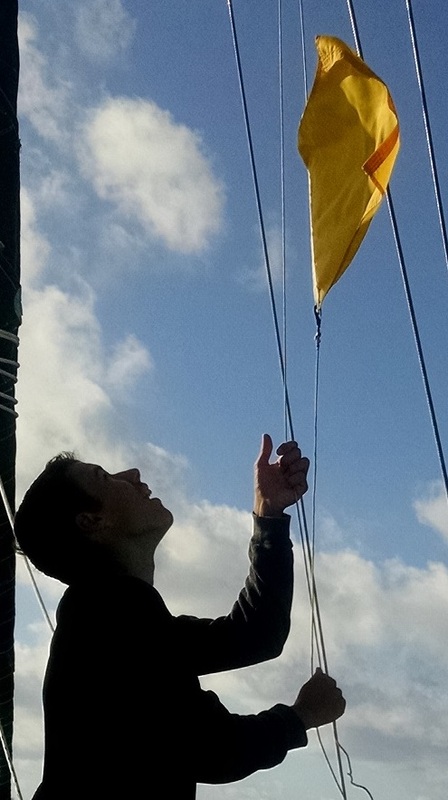 Here is a look at the courtesy flags we have raised since leaving the US waters. Our first courtesy flag raising was very exciting! It was the first time that Cash and Nicole had traveled outside of the US. 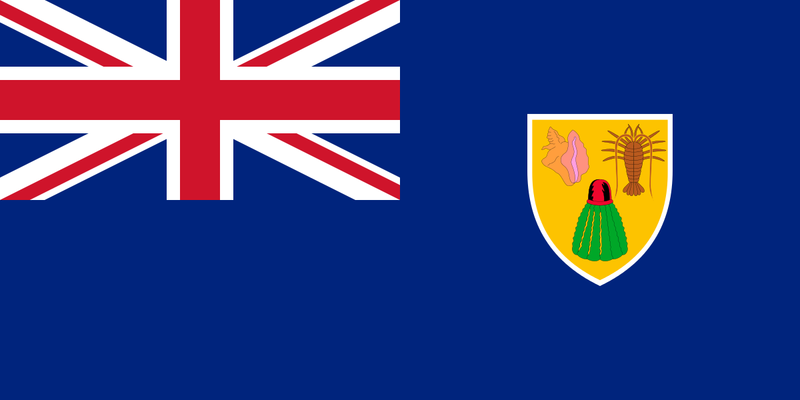 Like other former British dependencies, the Turks and Caicos flag has the Union Flag in the canton. Also pictured on the flag are a conch shell, lobster, and cactus. Our DR flag was quite tattered by the strong trade winds after our stay of two and a half months during the 2014 hurricane season. Like the US states, Puerto Rico has its own flag. When we were first here in 1999, I hand-stitched a courtesy flag. 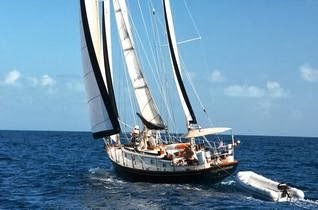 However, there's actually no need to fly it since in PR, we are a US boat in a US waters. 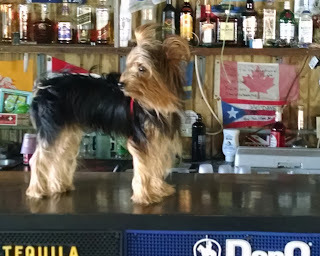 So this time we donated our hand-made flag to a great bar in Salinas - Sal Pa Dentro. (That's it behind the bar in the picture below). Saint-Martin is an overseas "collectivity" of France. This is a first-order administrative division of France, a status given to some former French overseas territories. As such, the courtesy flag for the French side of this island is the French flag. Saint-Barthélemy was previously a French commune forming part of Guadeloupe. 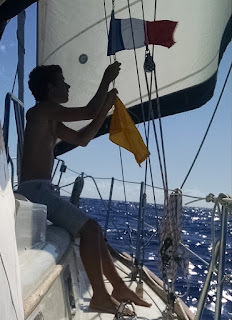 A 2003 vote changed the status to an overseas collectivity, so we fly the French flag here too. 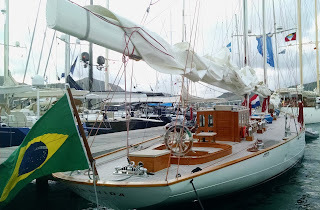 Saba is a special municipality of the Netherlands, classified as a public body. It is one of three Caribbean islands (the others being Bonaire and Sint Eustatius) sometimes referred to as the Netherlands Antilles or the Dutch Antilles. 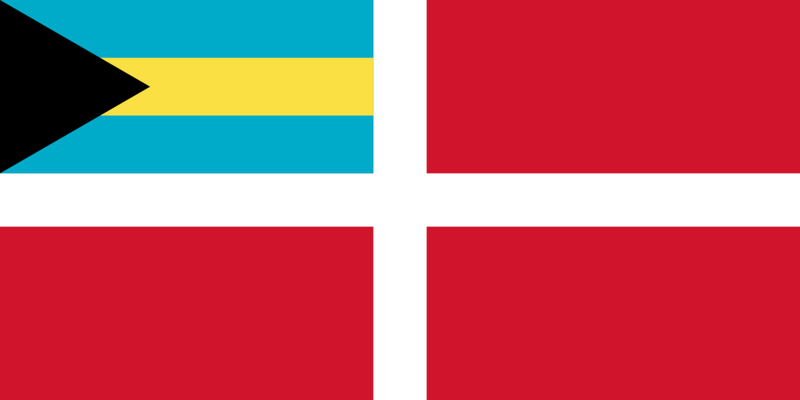 These three islands use their own courtesy flag rather than that of the Netherlands. Back again in St. Martin. 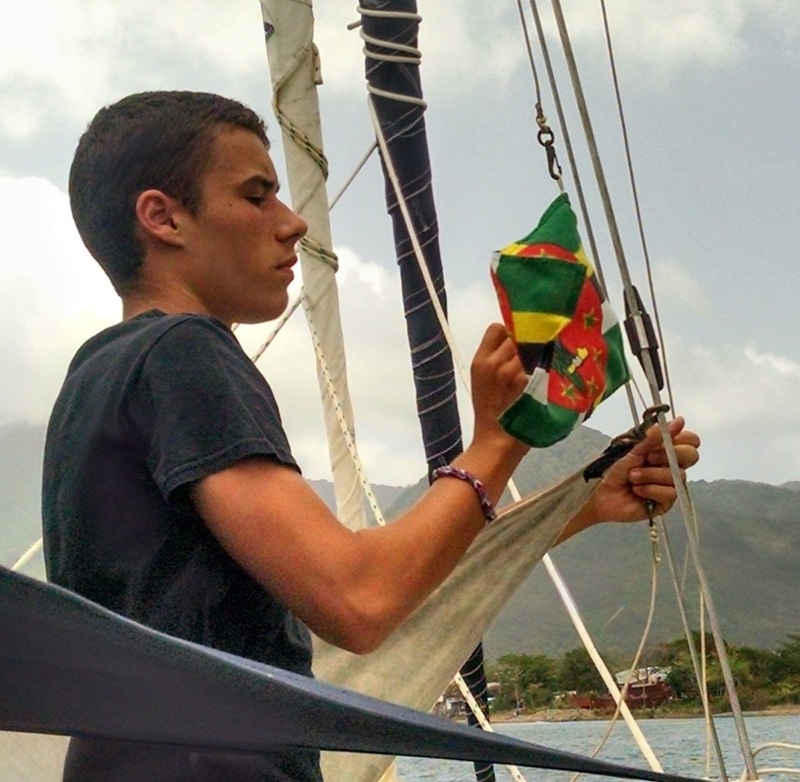 Here, Cash is swapping the Saba flag for the St. Martin (French) flag. We checked in so quickly that we skipped the Q-flag step. 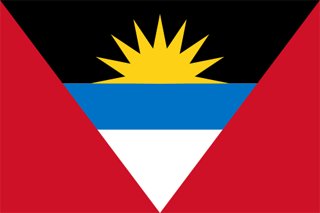 The flag of Antigua and Barbuda came into use with the country’s transition to self-government in 1967. A competition for the design of the flag design had more than 600 entries by local people, with the winning selection by Sir Reginald Samuel. Guadeloupe is considered an overseas region of France. Previously called overseas departments, these regions have similar powers to the regions of metropolitan France, and they participate as members of the Senate, National Assembly, and European Parliament. 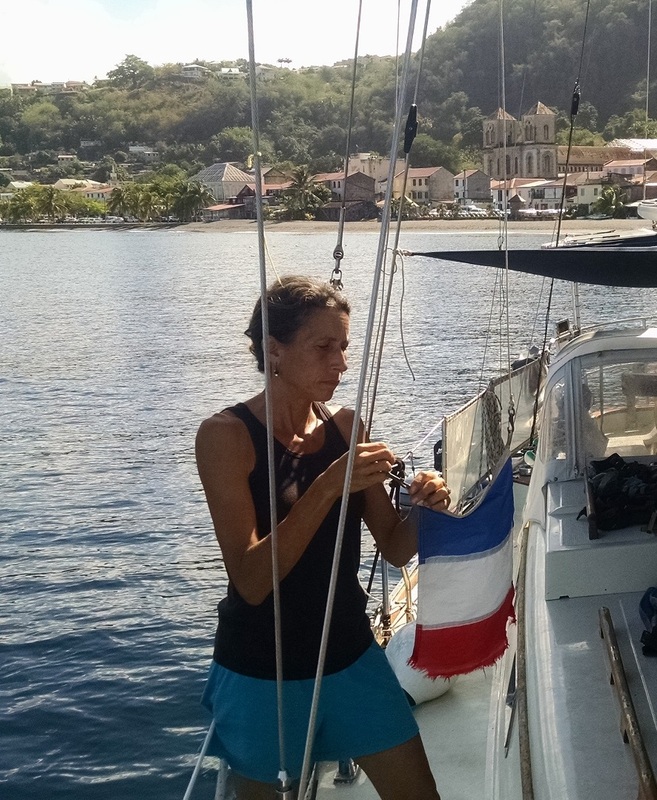 The department of Guadeloupe also includes its Dependencies, the smaller islands of Marie-Galante, La Desirade, and Iles des Saintes. 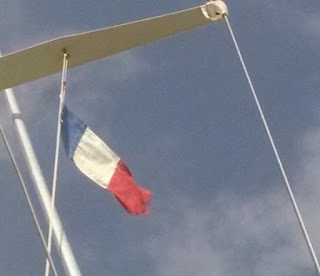 As a direct part of France, the courtesy flag here is the French flag. 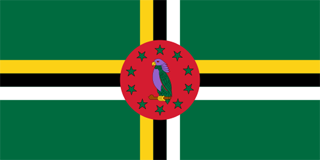 The flag of Dominica pictures the national bird, the sisserou parrot. We didn’t manage to spot any of these parrots on our hikes through the country, most likely because they are endangered with only 250 to 350 individuals left in the wild. Like Guadeloupe, Martinique is an overseas region of France. 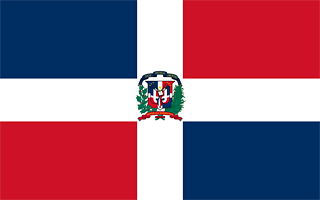 Together, Martinique, Guadeloupe, St. Barths, and St. Martin are referred to as the French West Indies. 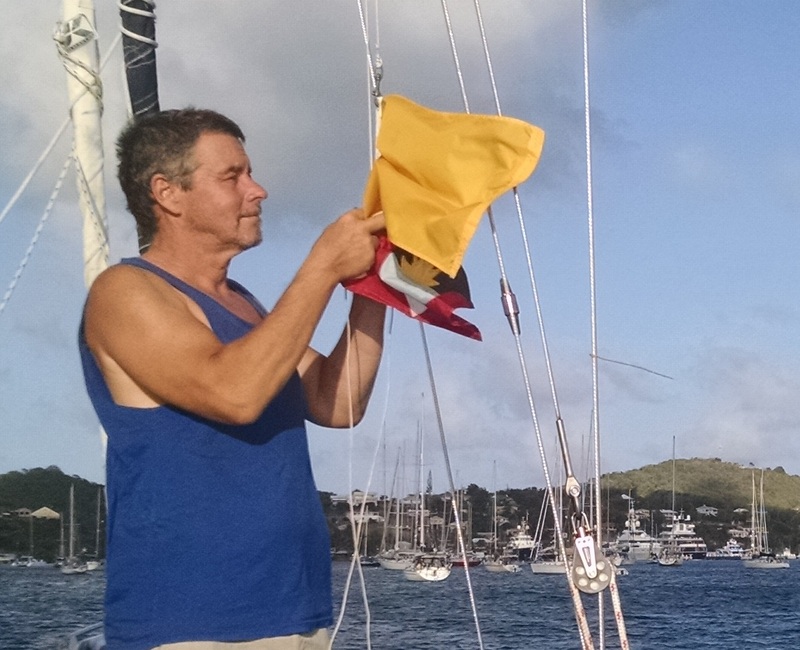 We "Q-flagged it" in St. Lucia. 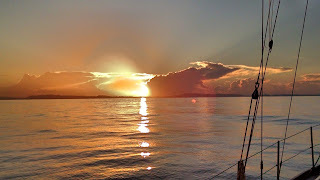 That is, we anchored overnight and left the next day, without ever setting foot on land. 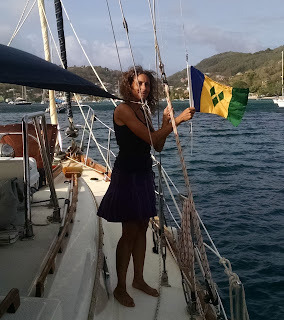 We did not need to raise a St. Lucia flag since we did not check in. 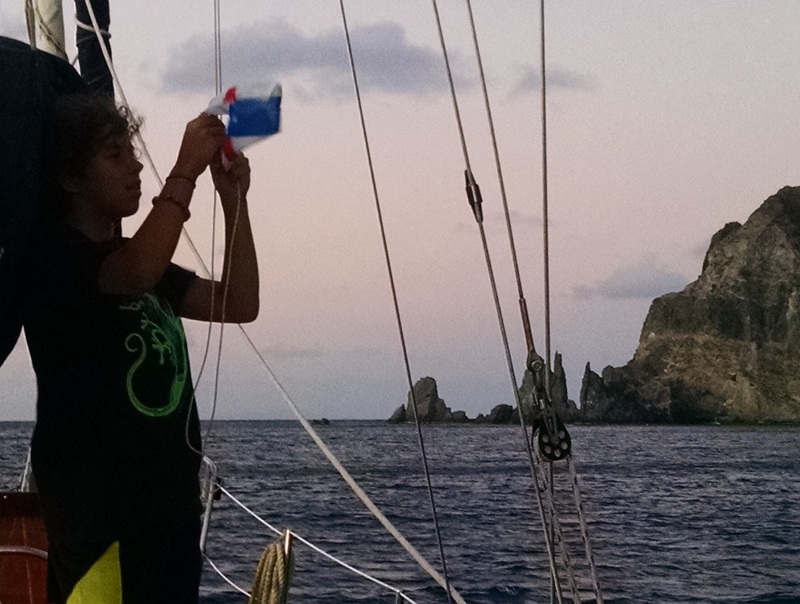 We skipped the main island of St. Vincent and headed straight to Bequia, the northernmost island in the Grenadines. 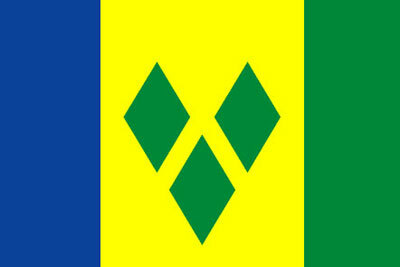 Most of the small Grenadine islands are within the political boundary of St. Vincent. 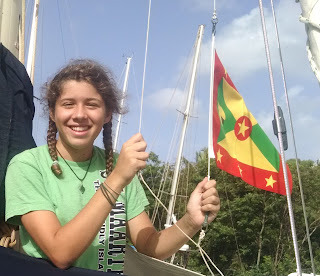 We raised our flag of Grenada when we reached Carriacou, the southernmost of the Grenadines. 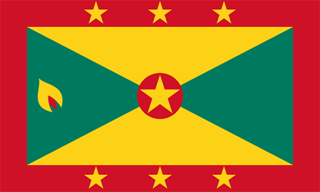 This Grenadine island, along with Petit Martinique, is actually part of Grenada. Nicole raised our courtesy flag while the boat was hauled in the Carriacou Marina.